For those you who where able to see the Milwaukee Art Museum’s Salon-style hang in Gallery 10 a couple of years ago, this painting may look familiar. This is because it is a Layton Art Collection painting that was brought out of storage for that display. Happily, a number of paintings from that special installation will be included in the European galleries once we reopen, and we anticipate that this painting will be one of them! The scene is a pastoral landscape at Arundel, which is an English market town in Sussex, about 50 miles southwest of London. At the left, a farming family harvests grain. Meanwhile, sheep graze along the country road. A plow stands abandoned on the far right. 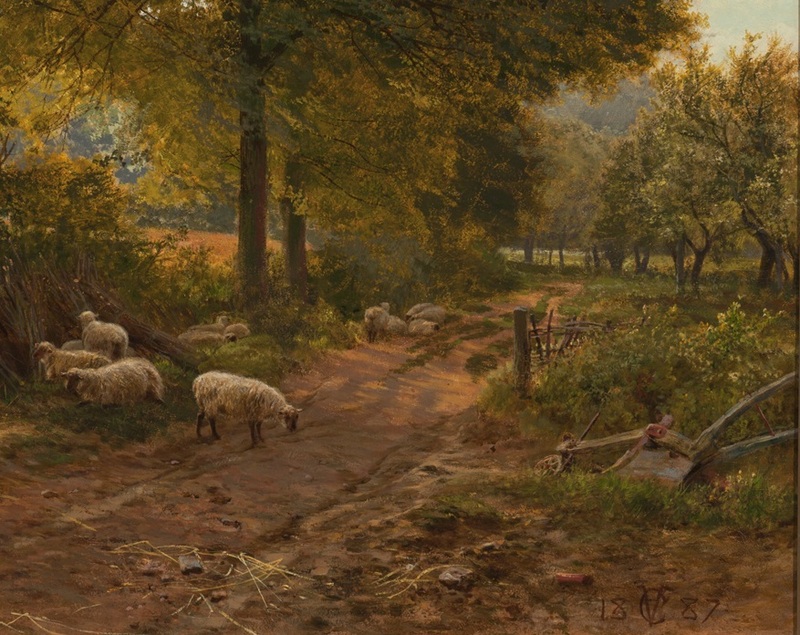 This type of landscape was extremely popular in both Europe and America in the late 19th century. It is part of the tradition of glorifying country life that began with French Realists of the mid-19th century such as Jean-Francois Millet. At that time, the industrial revolution was drawing people from villages to dirty, crowded urban areas with the hopes of a more prosperous life. Those in the city began to feel a nostalgia for the beautiful and peaceful countryside, a time and pattern of life that many felt had past. Of course, these paintings also idealized the work done in the country, glossing over its difficult, dangerous aspects. At Arundel, Sussex manages to balance a number of elements while creating a lovely mood. The hills off in the distance are hazy with the damp, warm air of late summer. The glorious golden grain seems to go on forever—it makes you feel a bit sorry for the family that has just started to harvest it. The sheep are relaxed and comfortable, some of them sleeping in the tall grass. Bundles of branches lean against an old fence–they might be fuel, or they could be material to fix the fence. The meandering road disappears in the distance between trees planted long ago. What really makes this painting magical to me is the huge tree centered on the canvas. It visually shelters the figures below, its majesty seems to be the focus of the painting. It reminds me of some of the wonderful old oaks you see in Wisconsin’s Kettle Moraine. As an Englishman proudly painting the countryside of his native land, I think that Vicat Cole felt some of the same power and beauty in this tree. 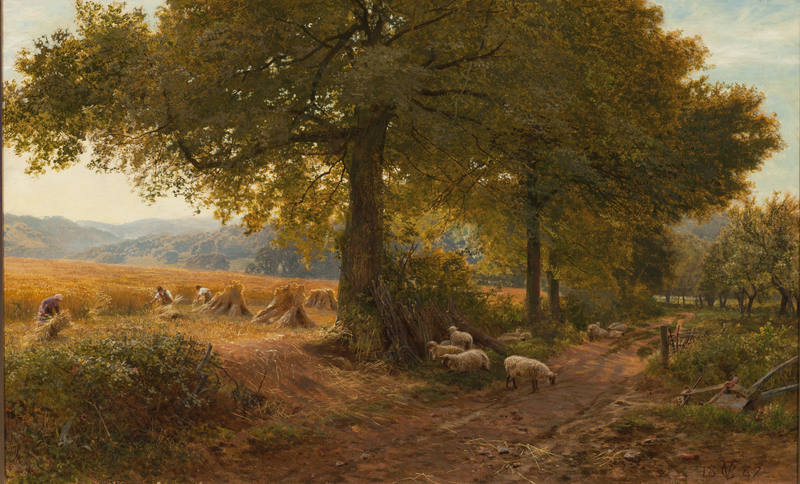 George Vicat Cole is not a well-known artist, but he was a fixture in late Vicatorian England. He was the eldest son of the self-taught landscape painter George Cole. In 1855, the younger George quarreled with his father and left the family home. He adopted his mother’s maiden name, Vicat, to set himself apart from his father. As he started his independent career, Vicat Cole was especially influenced by the Pre-Raphaelites. This short-lived but very important group of avant-garde English artists included William Holman Hunt, John Everett Millais, and Dante Gabriel Rossetti. In particular, the Pre-Raphaelite artists were committed to depicting nature as they saw it. Despite his interest in the Pre-Raphaelite movements, Vicat Cole’s career was not ground-breaking. He exhibited almost yearly at the Royal Academy between 1853 and 1892, being elected an Associate in 1870 and a member in 1880. He became good friends not only with John Everett Millais, but also Frederick Leighton. With his popularity and his reputation, therefore, it is not surprising that one of his paintings was given to the Layton Art Gallery in 1888! 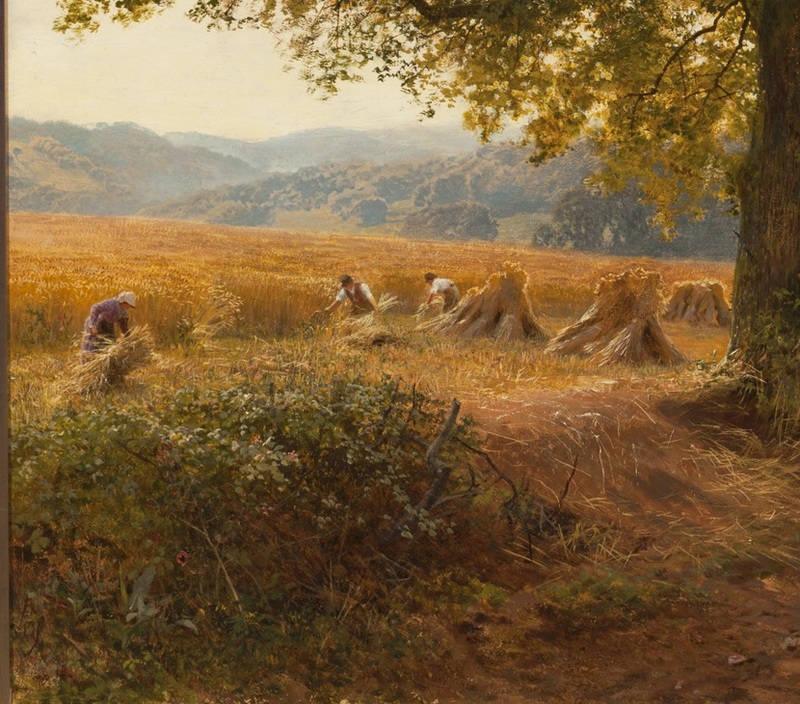 This entry was posted in Art, Curatorial and tagged george vicat cole, landscape, preraphaelite. Bookmark the permalink.